Kick off long summer weekends with the classic warm weather stable, boat shoes. While they might be part of a more preppy male sense of style, all gentlemen alike can appreciate their comfort when worn in the sunlight. When it comes to boat shoes, these sailing slip-ons pair perfectly with everything from cargo shorts to jeans, khakis and more. However, you don’t have to be a sailor by heart to sport them. Sure, the traction on boat decks in unbeatable, yet, so is the comfort and style for morning walks spent out by the beach. It’s a lot like wearing them without or without socks, the choice is entirely yours. 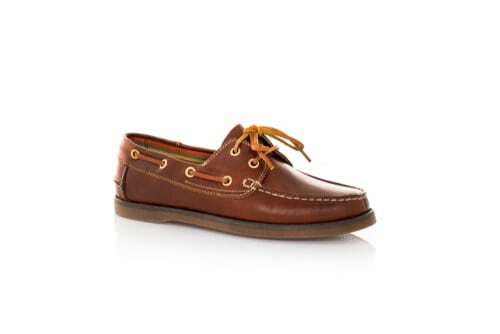 With that said, before I get into the top 35 best boat shoes for men below you might be curious to know how this iconic footwear first got it start. The story dates back to the 1930’s with Paul A. Sperry, a devoted boated and sailor from New Haven, Connecticut. One cold winter morning Sperry watched his dog zip across the ice without so much as slipping a foot. In the moment he had realized the pads of his pup Prince’s paws formed a herringbone-like pattern with all the grooves and cracks. By cutting a siping pattern into the soles of his own shoes he had managed to unlock the power of a phenomenally strong grip. Within time, Sperry would share his discovery to the world under the Sperry Top-Sider company. 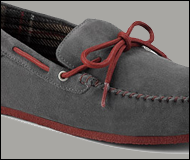 Since then, boating shoes have become a stable in popular coastal area footwear over the years. Now, aside from the siping pattern for secure sea legs on a wet deck, most boat shoes today as feature oiled leather to repel water. You’ll also find a 360-degree lacing system, typically with rawhide and two or three eyelet, plus a moc-toe construction. 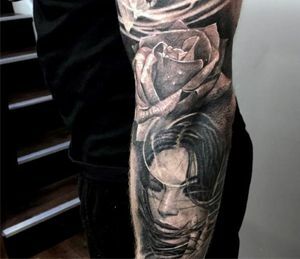 Of course, the fashionable styles you’ll find below feature a wide range of variations from the tried and true traditional to the more bold and modern. Regardless of which suits you the best, make this summer one where you say goodbye to slippery sea legs in exchange for comfort and class. When it comes to finely crafted leatherwork, Allen Edmonds is a certainly name to be known. Their new Eastport men’s boat shoe arrives with a handsome leather exterior in addition to rawhide lacing and vented screen eyelets. 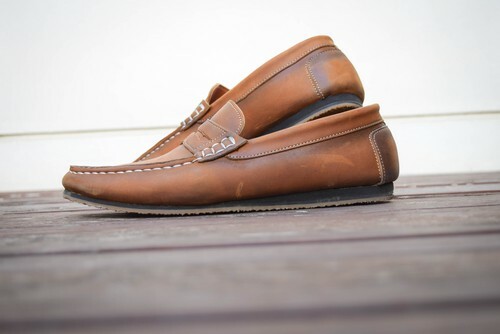 A Siped rubber sole offers generous traction and longevity, while a full leather interior lining makes any walk out on the patio or dock a true comfort. Frye’s latest creation, the Sully Boat Shoe features the classic nautical loafer with a supple full-grain leather exterior in your choice six different colors. From camel to burgundy and more, each comes with a traditional contrast-stitched moc toe and rahide lacing. With a timeless, traditional look, this style fairs well when paired to any sea legs in need of great support. 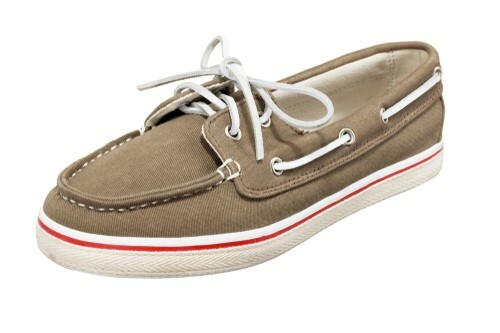 There’s a good reason why gentlemen mention Sperry when boat shoes are brought into any conversion. To own a pair means acquiring the privilege of fine craftsmanship, superior comfort and a wise investment thanks to their long-lasting durability. With their new men’s A/O boat shoes the same message ring true. Aside from what you’ll already expect form Sperry, like a handsome leather exterior and shock-absorbing EVA heel cup, you might be surprising to know just how personal they are. To match your attire without a hitch, Sperry offers thirteen different colors to choose from such as a Sahara, amaretto, navy and more. If you’re looking for great contrasting styling, look no further. Allen Edmond’s South Shore men’s boat shoes feature a rich brown leather exterior paired with nautical blue accents found in the laces, rubber sole and lining. Of course, if that wasn’t enough, there’s also a strikingly handsome wood outer sole finish to truly pull everything together. It’s not often that you find boat shoes with perforated leather on the exterior. 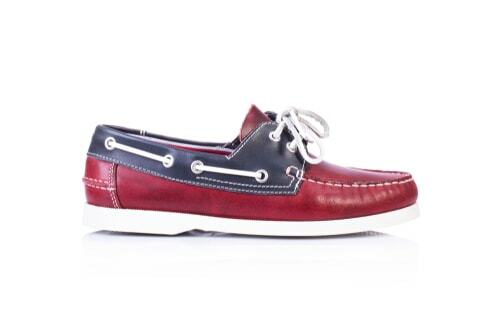 Luckily, John Varvatos offers the style with their new men’s Drifter boat shoe. While the look does appear more professional at first glance, things are considerably casual thanks to two eyelets and a slotted collar. For finishes, two options are available including lead (dark brown) and oiled blue, both of which, arrive with a leather lining on the interior. With over 30 different styles to choose from, it’s hard to beat just how personal Sebago makes things with their men’s Spinnaker boat shoe. From the mocha nubuck to navy canvas, golden tan and even pink, your options are endless. 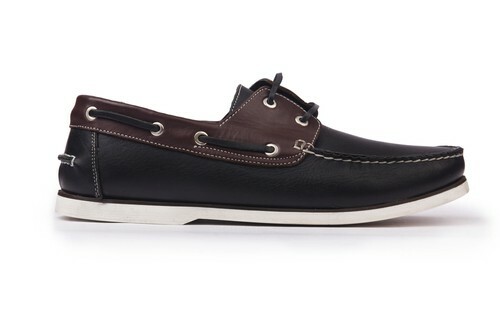 In a sense you could say Sebago has taken the iconic look and made it personal again. While there are a handful of new twists on the classic, each still arrives with a slotted collar and moccasin toe stitching. 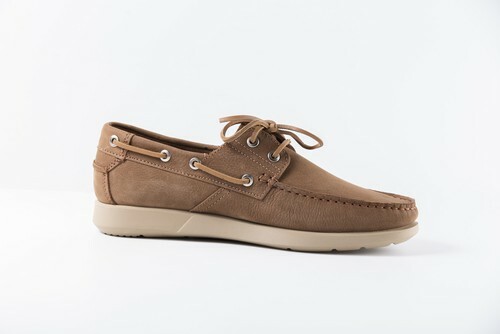 A molded EVA foam insole makes the Dockside boat shoes by Sebago a breeze to step around in. While a non-slip rubber outsole keeps your sea legs grounded. To fit your own unique sense of style, the Dockside is offered in twenty different colors; all of which, have a leather exterior finish, moc-toe stitching and rawhide lacing. 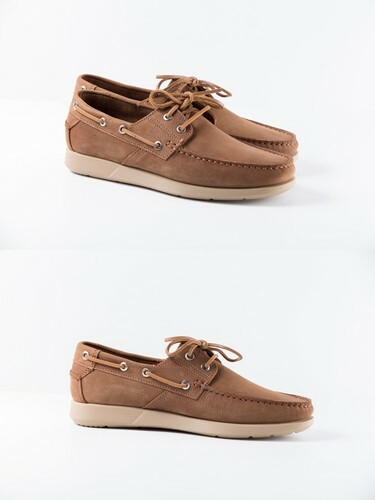 A great take on a classic, Timberland literally named their two-eye boat shoe the Classic. While the look does a have more sporty flair, you’ll still find the tried and true slotted collar, rawhide lacing and moccasin toe. As a plus, Timberland has included a super comfy EVA insert that cushions every step thanks to Poron foam. With premium full-grain leather, sued and nuuck leathers combined, it’s easy to look good on any beach or boat. 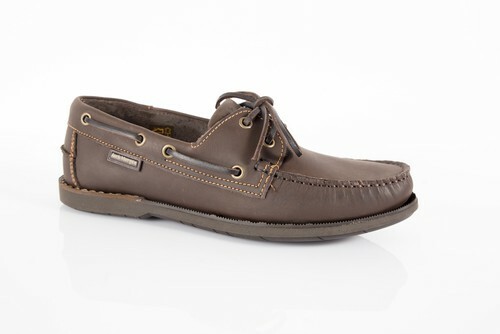 For a little more character and comfort just slip on the Sperry Top Sider Authentic Original Burnished men’s boat shoes. Each arrives with a slightly worn in finish on the exterior and a plush interior that compares to your favorite pair of broken-in kicks. The classic nautical loafer also features brown rawhide laces and moc-toe stitching for a great contrast against the four leather choices. With blue, grey, ivory and orange to chose from, these top-siders feel as good as they fit your own personal sense of style! 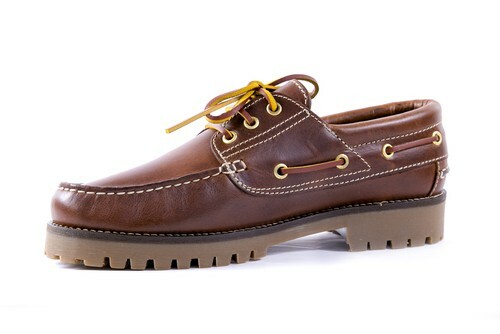 Like all leather boat shoes, Timberland’s Earthkeepers Kiawah Bay’s run large in size once the leather has broken in. To keep you comfortable in the process, each shoe features an anti-fatigue footbed made of 100% recycled PET. 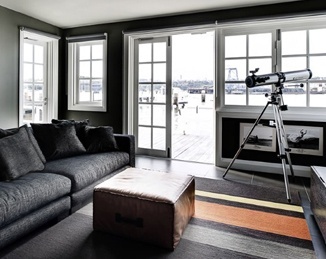 Of course, you’ll also find a neat nautical flag print on the interior as well for a subtle touch of style. On the exterior, Timberland offers ten different color choices, all of which, arrive with a handsome leather finish. 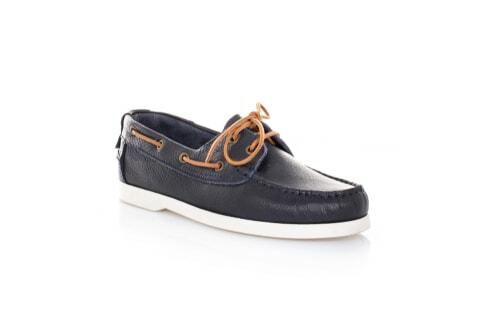 While quality can be a hit or a miss for some gentlemen, it’s hard to beat the stylish good looks offered in Tommy Hilfiger’s Bowman boat shoe. All six color choices feature moc-toe stiching, 360-degree rawhide lacing, and a thick rubber sole. Timberland’s latest shoe creation arrives in two options including brown with navy or your choice of light brown. Regardless of which you pick, you’ll find handsome details such as the embrossed quarter panel logo and contrast moccasin toe stitching. From cargo shorts to jeans, the Heritage Two-Eye boat shoe makes for a great look! For the ultimate in summer comfort and weekend getaway style, just consult Rockport’s Bennet Lane 3 shoe. All five color choices arrive with a sturdy, yet, flexible Stobel construction. You’ll also find an ultra plush EVA footbed that matches the contour of your foot for a truly one of a kind fit. A rubber outsole will give you a better grip on the the world, while the Adiprene shock absorbing heel with cushion whatever is thrown your way. Discover a different take on the classic boat shoe design with Sperry’s Top-Sider Billfish 3-Eye. With eleven different options to choose from, each arrives with a leather and textile exterior. However, aside from charming good looks your feet will thank you for the molded polyurethane midsole and shock-absorbing footbed. It has never been more comfortable to put your best sea-worthy foot forward until now. Of course, you’ll also enjoy the perks of the wave Siping outsole groves which work their magic to move water out of the way for superior boat deck traction. For a more premium and professional fashion, Mephisto has the answer with their new Hurrikan shoe. Upon first glance you’ll notice a strikingly well-crafted leather exterior paired with a Siped Caotchouc rubber outsole. Five colors are available including dark brown, rust, black smooth, and more. Regardless of which finish suits your style or your yacht the best, the latex foam midsole is sure to be quite a treat for your feet. With every step the footbed conforms to your foot’s unique shape for added shock absorption and comfort. If you prefer the more casual look, the Polo Ralph Lauren Rylander makes for a great fit. All five colors feature an textile canvas exterior paired with a touch of leather on the top collar. Of course, you’ll also find the traditional rawhide laces, plus rolled moccasin stitching as well. In terms of comfort, these boating shoes will give you quite the surprise. Just about any man can wear them around all day, every day without the pain or discomfort. A more modern take on the classic, Lacoste’s latest boating shoe arrives in your choice of brown or dark brown. Each features a solid leather exterior construction, rawhide lacing and slotted collar. You’ll also find subtle details like the embossed crocodile logo at the top plus a bolder, contrasting white sole at the bottom for one well-polished look. For a more relaxed sense of style, Frye’s Norfolk delivers. All three colors including Indigo, Cognac, and Cement feature a rounded toe box and soft leather. While you might think the soft leather could be an indication of low quality, you’ll be surprised. It’s actually quite thick and rugged, which means order a size up. These boat shoes tend to run about half a size smaller given their construction. Any gentleman who prefers the preppy lifestyle will enjoy the professional appeal given off by Polo Phalp Lauren’s Binne boat shoes. All five dyed leather options arrive with great traditional touches including moc-toe stitching and leather laces. Of course, you’ll also find a rubber sole to keep your sea legs both stylish and steady during rough seas. If bold colors and patterns are your thing, the Clarks Jax will suit your style well. 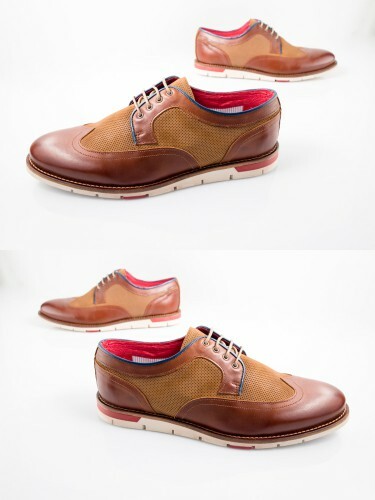 Sure, the design resembles the classic boating shoe, however, the mix of colors truly makes this men’s shoe stand out. Take for instance the red canvas paired with a brown leather upper, white outsole and plaid interior fabric; it certainly makes a fashionable statement. To make things more personal Clarks offers the Jax in six different options. Shorts, jeans, khakis and more, the Rockport Ports of Call Perth Slip-On goes well with any summer style. With five leather color options, each arrives with a two-eyelet design, durable construction and ultra-comfortable footbed. While they are considerably firm at first, over time you’ll like how the rugged leather offers an ample amount of flexible give. With or without socks, these Rockports look as first-class as they feel. Small details make Sperry’s Billfish Ultralite boat shoes stand out in a good way. While they might be similar to the regular Billfish, the key difference can be found in their super lightweight nature and downright phenomenal comfort. You’ll also find a contrasting outsole that won’t leave marks on your boat regardless if you go with the black or green options. Of course, at the bottom of every shoe rests Sperry’s unique razor-cut texturing for a solid sense of traction in both wet and dry conditions. 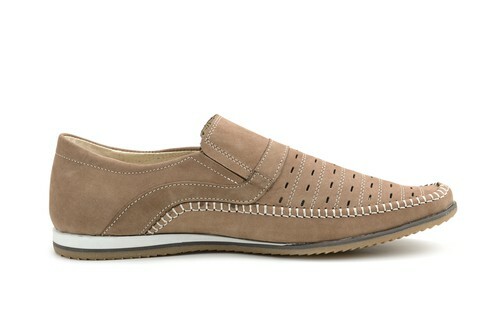 A sleek looking suede exterior encompasses these sporty loafers by Kenneth Cole Reaction. 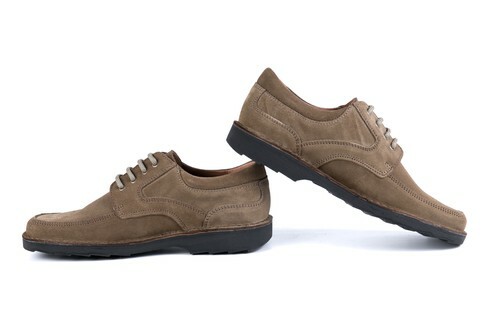 Both brown and grey options arrive with a moc-toe, rubber outsole and plush leather lining on the interior and footbed. Just keep in mind By The Bay boat shoes generally run a size larger than you’d expect. Talk about a well made and durable boat shoe, it’s really hard to beat the Olukai Mano. With seven different leather exteriors, matching your own sense of style is literally a breeze. Not to mention, each arrives with a waterproofed and wax nubuck leather upper for longevity and great looks. While one look on inside delivers a glance of ultra-comfortable microfiber with moisture wicking action. As an added plus each boating shoe also features an EquilFit, dual density PU footbed and leather laces to keep things cozily snug yet, firmly secured. Both chestnut and camel leather options found on the Mephisto Felix arrive with durable construction quality. You’ll find their fit to be slightly larger than most, and their comfort level to be considerably higher. The shock absorbing heel when paired to the cushioning footbed makes it feel like you’re walking on air. Sure, the price is up there, however, in exchange you get handmade boating shoes that last. When it comes to finer details, Clarks didn’t miss a beat. Their new Huxley boat shoes for men feature great sea-worthy touches like rawhide leather laces and breathable canvas on the sides. 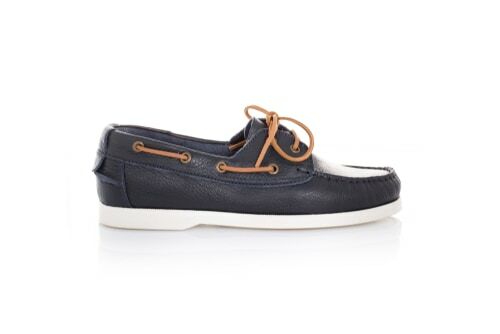 To finish the nautical-inspired look, you’ll also find rich, nubuck leather on the exterior. In terms of comfortable it’s exceptionally top notch, which is surprising given their lower price point. Meet the Dunham by New Blanace AFT 2-Eye men’s boat shoes. Both tan and brown leather exteriors arrive with a lightweight compression resistant midsole and removable insert. You’ll also find a 360-degree lace-up closure to acquire that perfect, just-right snug fit on your feet. For smoothing sailing without all the added weight, the Dunham AFT makes for one great fitting deck shoe. With one of the highest price points on the list, it’s no surprise Trask’s Custer is made right here in the USA. Each features Horween American Bison leather on the exterior and interior, plus, a lightweight vibram outsole. In terms of comfort you’ll find it matches that of the ridiculously solid construction, perfection. If you still remember what it’s like to own goods made in the USA, you’ll know why Red Wing Shoes has been in business for so long. Sure, their prices are higher than most, but let’s face it, it’s a true reflection of quality. The Wabasha offers considerably more value in the long run once you considering how long they last. With their latest boating shoe you’ll find thick leather that’s super supple to the touch and a vibram sole for ultimate in comfort. For boating shoes that fit like a glove and rival the craftsmanship of competitors, it’s hard to beat the quality offered in Mephisto’s boating slip-on. With eight unique exteriors, you’ll find each features a rich, Sup-Hydro water-resistant finish. To keep your feet comfortable there’s also soft air technology found in the padded footbed to cushion and wick away moisture. No matter what the weather conditions you can be sure your feet will be resting in paradise year round. Frye’s Henry Knotted boat shoe features a new take on the timeless design. While technically a casual shoe, the look gives offer a considerably professional demeanor. You’ll find contrasting laces on both the tan and dark brown options plus, durable moc toe stitching. 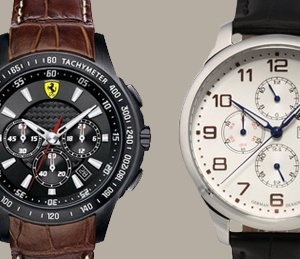 When it comes to Cole Hann you can expect top notch quality and modern style. In comparison to most shoe brands they offer something a little bit different when it comes to the materials, sewing construction, etc. It’s a good reason as to why the price is higher than most as their shoes actually last. Their latest boating shoe, the Great Jones, is no exception. 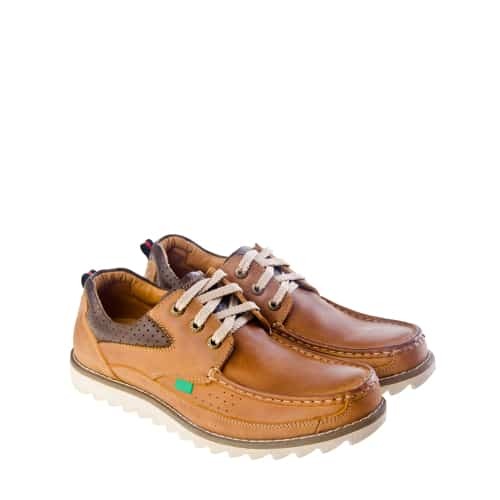 It arrives with a stunning leather exterior, eye details at the collar, a stitched moc toe and much more. So durable, Gokey named them the World’s Most Durable Boat Shoes. Each arrives with a self-cleaning Vibram sole for top notch traction and a water-repellent leather found in their renowned Snakeproof boots. With the higher price tag you can expect premium materials like the seven ounce, oil-tanned leather in addition to a fine attention to all the same details. While these might be Cole Haan boating shoes, they do feature Nike Lunarlon technology to up the comfort level. Upon putting them on you’ll notice they fit like a regular boat shoe, however, they are far from the traditional amount of support. You certainly won’t find thin soles or a lack of cushion here. The Lunargrands were made for walking on the deck all day long. Both chestnut and castle rock options arrive with a moccasin-stitched toe, laced collar and a ribbed midsole to finish off the look. For an added touch of character, Frye has taken a new approach with their Sully Woven Venetian Loafer. As you’d expect given the name, all colors including camel, cognac and navy arrive with a woven side panel and flexible goring inserts. Needless to say, it’s an interesting mix between sophisticated and casual. In terms of comfort, you’ll like how to the woven nature hugs your feet and provides plenty of breath-ability to keep your toes cool.